This chapter argues against approaching urbanism as a production and storage problem, and for focusing on the potentials of informal urbanization. The informal economy is not just a coping strategy in the Global South, but it is permeating the creative and culinary sectors in Western cities. This chapter demonstrates how Lean Urbanism can disrupt the sclerosis of conventional planning, help people with fewer means contribute to their communities, and make nicer places. Lean Urbanism relaxes codes and challenges conventional development processes in Pink Zones, designated urban districts that relax the ‘red tape’ of zoning and building codes. The chapter concludes with an example of an open-source toolkit that underlies Lean Urbanism and focuses on energy-efficient buildings. Sadly, we lost Hank Dittmar in April 2018. He was one of the very first to articulate the environmental paradox of cities, as well as to think about public space and urbanism as more important than individual buildings. He fervently believed that built capital is the physical stage upon which humans live out their lives. His presence, wisdom and insight will be missed. Dittmar, H. (2014). Localism in England—Lessons for lean urbanism. Lean urbanism case studies. 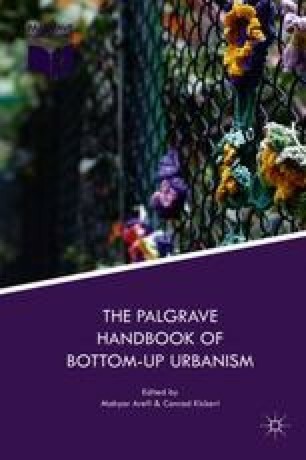 Retrieved from https://leanurbanism.org/publications/localism-in-england-lessons-for-lean-urbanism/. Dittmar, H. (2015). The lean scan—Activating community assets. Lean urbanism case studies. Retrieved from http://leanurbanism.org/publications/the-lean-scan-activating-community-assets/. Luis, A. (2016). In the aftermath of Oakland’s tragedy, how museums can better serve local arts and DIY venues. Smithsonian Magazine. Retrieved from http://www.smithsonianmag.com/smithsonian-institution/aftermath-oaklands-tragedy-how-museums-can-better-serve-local-arts-and-diy-venues-180961418/#KSEkTGVjuw9sl7IC.99. Wales, H. T. P. o. (2009). A speech by HRH: The Prince of Wales at the Prince’s Foundation for the Built Environment conference 2009 titled globalization from the bottom up. Retrieved from https://www.princeofwales.gov.uk/media/speeches/speech-hrh-the-prince-of-wales-the-princes-foundation-the-built-environment.